The best-selling car in North America is the Toyota Camry and Toyota wants to keep it that way. This new revamp comes just three years after the previous one in 2015. This new-generation Camry has better powertrain designs, a more aggressive look, and a nicer interior. All while keeping the Camry’s core principles of reliability and the ability to meet the needs of its audience well. The Camry probably won’t be replaced as the nation’s best-seller anytime soon. There are three powertrain options for the 2018 Camry, starting with the four-cylinder base model, the upgraded V6, and the Hybrid model. 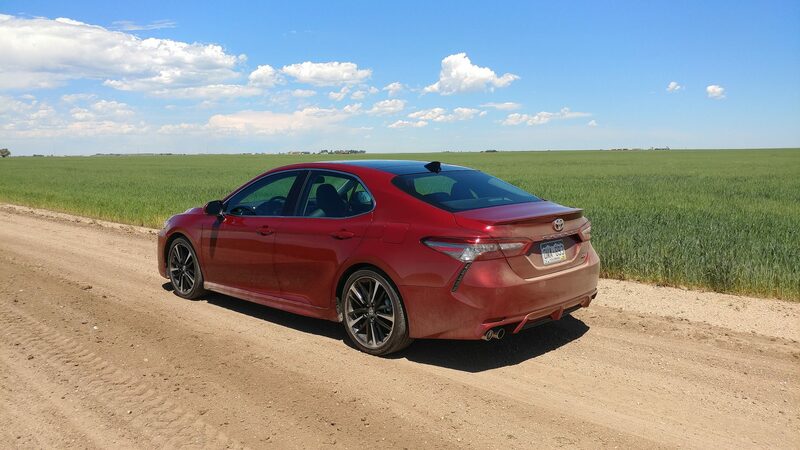 We drove the latter two, but are basing our assessments here on the mid-line V6 (the 2018 Camry Hybrid was reviewed here). The 2018 Camry has been the go-to vehicle for midsize sedan buyers for decades. It offers a good interior experience, has a reputation for reliability, and generally gets the job done without any flair or attention grab. The Camry is generally known as sedate and dependable, both qualities what many in the automotive market consider top requirements. The Camry was redesigned in 2012, then “refreshed” with what amounted to a full redesign again in 2015, and now sees another full change. Most of these changes for the new-generation Camry are seen in its bodywork, which is more aggressive, has better curb presence, and stands out better against the ever-encroaching competition. The new look for the Camry is a big leap forward in terms of Toyota design, which has always been fairly conservative. 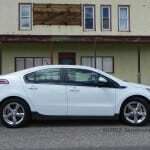 Other items seeing change are the drivetrains, interior, and drive quality. The 2018 Toyota Camry is a top-down upgrade for the car. The 2018 Toyota Camry comes in five trim levels (not including the Hybrid, which comes in three). Standard equipment in all Toyota Camry models includes Toyota Safety Sense active safety technologies such as frontal pre-collision, lane departure alert with steering assistance, automated high beams, and adaptive cruise control. L – As the base model for the 2018 Camry, the L includes 16-inch steel wheels, automatic LED headlamps, cloth upholstery, a rearview camera, keyless entry, a 7-inch touchscreen infotainment interface, a USB port, Bluetooth connectivity, and a 6-speaker sound system. There are few upgrades available to the L model. LE – The more common entry-level option for the Camry, the LE offers a power-adjustable driver’s seat, 17-inch alloy wheels, and a 60/40 split-fold rear seat. SE – The first of two “sport” models for the Camry, the SE upgrades from the LE with a more sport-tuned suspension, sport-oriented steering calibration, paddle shifters, 18-inch wheels, and simulated leather upholstery. XSE – An upgrade from the SE, the XSE adds larger wheels, dual-zone climate control, leather upholstery, a head-up display, blind-spot monitoring, keyless ignition, power-adjustable passenger seat, more USB ports, an 8-inch infotainment screen, premium JBL sound, and Qi wireless phone charging. XLE – Similar to the XSE in accoutrements, the XLE does not include the suspension and steering adjustments, but is otherwise similar in content. The exterior of the 2018 Camry has a sleek front fascia with curvy grillework in line with other Toyota designs of today. Thin headlamps and a well-rippled hood create a dynamic impression while bold, but simple lines along the body emphasize the tires that have been pushed out to the edges of the car. A faster-paced roofline sits lower than it did before, but doesn’t compromise interior spaciousness. Lower seating arrangements and improvements to interior space-saving techniques have meant there’s actually more room in the new Camry. The dashboard is a bit higher, giving more knee and legroom up front, and the rear seating retains its well-loved roominess from the previous generation. The outboard seats are very good and the center position, mostly good for kids, can hold an adult for short trips. Sadly, the improvements to the 2018 Toyota Camry did not include upgrades to the infotainment. It’s still lackluster and below par on every measure. For those who merely Bluetooth from their phone and listen to satellite radio, the Entune entertainment suite is enough. Those who might want more, however, will be disappointed in the slim offerings and slow menus of the infotainment setup. Cargo space in the 2018 Camry is good, though, with a roomy trunk and plenty of small item storage throughout the cabin. Chassis changes to the 2018 Camry mean that it drives much better than it did before. Steering is more precise and feedback is more useful without being annoying or loud. The suspension remains tight without sending in every vibration and, though not sport-car-like, the suspension is much more agile than it has ever been. 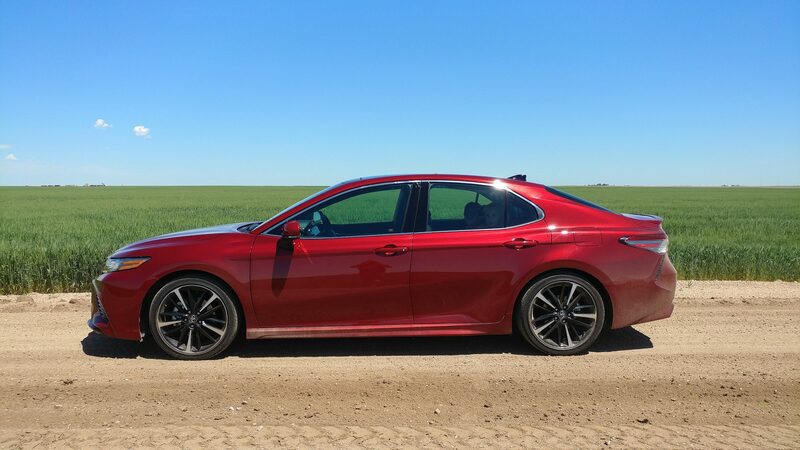 In short, the 2018 Toyota Camry is much more driveable. We like the improvements in the drivetrain options as well and most will enjoy the better fuel economy they afford. The base model is powered by a 2.5-liter four-cylinder engine that outputs 203 horsepower to an eight-speed automatic transmission. This powertrain aims towards fuel economy and isn’t in much of a hurry to do anything, but still manages to give some confidence to the driver when pressed into a pass or on-ramp run. The V6 option puts a freshly-upgraded 3.5-liter six-cylinder engine under the hood, creating 301 horsepower. That runs through the new eight-speed automatic transmission to the front wheels. Smooth power delivery and a confident drive are the qualities the V6 imparts to the Camry here. Some sportiness in the SE and XSE models is also had with slightly tighter chassis movements and more aggressive throttle responses. Finally, the 2018 Camry Hybrid mixes a down-tuned version of the four-cylinder and Toyota’s Hybrid Synergy Drive system. HSD puts a continuously variable transmission (CVT) and two electric motors onto the engine’s output shaft to deliver a total of 208 horsepower. 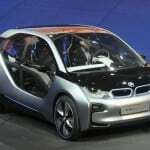 A small battery allows short-distance all-electric driving at lower speeds and the whole shebang offers much better fuel economy and, in our opinion, balance for the car’s drive quality. 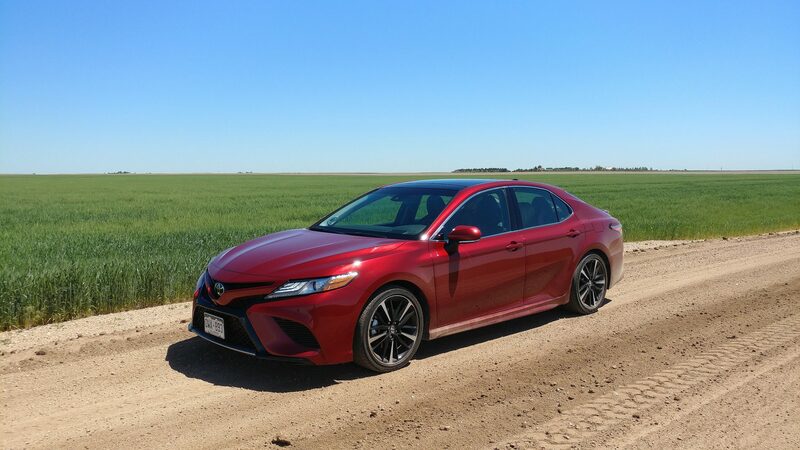 Fuel economy in the 2018 Camry rings in at 32-24 mpg combined in the four-cylinder model, 26 mpg combined with the V6, and 46-52 mpg combined with the Hybrid. The ranges reflect different options on the vehicles (trim level weight additions). Our experience in the real world showed that the EPA’s estimate for the V6 is about right on while the Hybrid’s return will vary heavily depending on the type of driving undertaken. More highway time means lower MPG in the Camry Hybrid, for example, as does a heavier foot when going out of lights and stop signs. There is no shortage of top-notch competitors in the midsize sedan market. We’ll point to those most competitive with the Camry. Honda Accord – The Accord has also been redesigned for 2018 and carries a lot of competitive excellence in its design. The Accord is sportier and more responsive than is the Camry, but may not have the same fuel economy returns. Hyundai Sonata – The Sonata hasn’t changed much since its redesign in 2015, but it’s still a good-looking sedan that competes well with the Camry on many fronts. 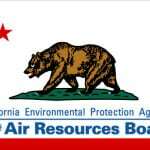 Including fuel economy when compared to the four-cylinder or V6 Camry. Kia Optima – A very well-designed car, the Kia Optima was redesigned in 2016 and remains popular for its more aggressive styling and good drive quality. It’s not as roomy as the Camry nor as fuel efficient. Mazda Mazda6 – One of the more underrated midsize sedans, we think, the Mazda6 has a beautiful style and great appeal on the road. The 2018 model adds a new turbocharged engine that upgrades the driving experience as well. Overall design is great with a roomy interior and good-looking exterior, giving the Camry more to bargain with. Good drivetrain options that cover the gamut of drive quality, fuel efficiency, and price tags. Strong safety scores with high crash test scores and advanced safety equipment as standard. Terrible infotainment that doesn’t do much on its own and doesn’t allow bypass via smartphone integration. Pricey sport models can add a little flair, but aren’t necessarily cheap. The 2018 Toyota Camry offers a lot to the midsize sedan buyer. Like the generations of Camry models before, it sticks with the winning combination of interior roominess and everyday appeal with stolid reliability expectation while now offering more style and better road feel. We’re now fans of the 2018 Camry. The Camry V6 and Camry Hybrid were a manufacturer’s press loan for about a week each. 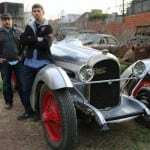 During that time, over 200 miles per car were put on the vehicles in varied driving conditions and with various passenger loads.